Our condo is located in the heart of town directly behind the Brian Head Fire House. Enjoy the most fantastic views in Brian Head. Our condo overlooks Bristlecone Pond and the Wildflower Lift and runs which can be seen from our two balconies. A private hot tub on the lower balcony allows you to enjoy these views while relaxing. You can see the town’s spectacular Fourth of July fireworks display from the balconies also! Brian Head is a popular location for winter sports. The resort gets around 400 inches of snowfall annually. Winter activities include: skiing, snow boarding, sledding, snowmobiling, snow tubing, and, of course, snow angel making. There are numerous locations for equipment rental and they are all very near the condo. You’ll never have to go far to get what ever your heart desires. Ski-in to 30 yards from the condo front door. Brian Head has recently linked the Navaho and Giant Steps ski runs with the “Interconnect” project. The interconnect included additional ski lifts (now totaling eight), and a bridge over the highway that enables skiers and snow boarders to enjoy both mountains without ever removing their gear. The Navaho ski area is excellent for beginners as well as those who enjoy longer, pleasant runs, and the snow tubing park is a must-do. Giant Steps offers excellent ski runs for every skill level up to double black diamond. When there’s no snow, Brian Head is known for mountain biking, ATV riding, fishing and hiking. The mountains are loaded with trails, and there are several cycling events during the warmer months. The ski lifts continue service during the warmer months to convey riders and their bikes to the top of the mountain for the down-hill bike trails. Summer and Fall are also excellent times to take advantage of the near by monuments and national parks. Cedar Breaks National Monument is only a 15 minute drive, where photography is unmatched, (not to mention excellent hiking). The beautiful Bryce Canyon and Zion National Parks are each about 1 ½ hours away by car. Our condo is the epitome of luxury accommodations. The master and guest bedrooms are both equipped with queen sized memory foam mattresses. The bunk room has two incredible built-in queen sized bunks with their own individual lighting! There is also a sofa which can sleep one child or one adult. Every counter top is beautiful Golden Ray granite and the floor tile is Italian style travertine. There is carpeting in the bedrooms for extra comfort during the cold months. The master bathroom has dual stone sinks and the huge corner whirlpool tub also has twin showerheads. You will find the kitchen fully equipped with dinnerware and utensils, and all appliances are beautiful stainless steel. Relax in our plush leather sofas while enjoying the 46 inch LCD screen T.V. with surround sound. You’ll also find LCD TVs and DVD players in each bedroom as well as the bunk room. Overall, there is plenty of room to sleep up to nine adults comfortably. On the ground floor, you will find the mud room where all your ski and snow board equipment can be conveniently stored. Here, you will also have access to our full sized washer and dryer so your “play” clothes can be ready for the next day. Check out our past guest comments. We love to ski and ride ATV's. Look at our past guest reviews and see what people have to say about our condo. Our condo we not disappoint if you want luxury accomodations. This is the perfect place to get away from the hustle and bustle for a while. The area is perfect for ATV riding in the warmer months and the skiing is incredible during the snow season. Ski-into 30 yards from the condo front door next to the Green 1 unit. Ski out not available. It is a short downhill walk (250 yards) to the Alpine Glow lift and the Interconnect bridge. 1/2 bath off kitchen features shower, sink and toilet. On the second floor of the condo. Master private bath with jetted tub and dual shower heads. On the 3rd floor of the condo. 2nd full bath upstairs off hallway services both 2nd bedroom and 3rd bedroom with built in bunk beds. On the 3rd floor of the condo. Brian Head Resort is southern Utah's premier winter destination. Brian Head Resort receives over 400 inches of powder annually. The resort features over 650 acres with eight chairlifts and 71 runs. The resort features Utah's highest base elevation at 9,600 ft. with a lift served vertical drop of 1,320 ft from Giant Steps. New tubing hill, new night skiing options, and magic carpet surface lifts. Watch skiers come down the lifts from our 2 balconies. If you prefer to spend your day in the hot tub, you can watch your friends ski while you relax in our hot tub on the lower balcony. Ski into the condo complex next to the Green 1 unit, our condo is Green 6 five doors down from Green 1. 350 downhill walking steps to the Alpine Glow chair lift. Ski-in is conditional based on skill. View the new Bristlecone Pond from the balconies. Parking for 2 vehicles in the garage. Stocked with sleds! Ski and snowboard storage area. Long driveway can fit additional 3 vehicles. Custom Dinnerware and Flatware provided!! Wall mounted flat screen TVs with DVD players in all bedrooms and living room. 100's of DVDs to choose from. (2) 2 Balconies with view of the slopes. Ski into 30 yards from condo front door. No ski out available. Walk out 250 yards to Alpine Glow chair lift. 4 person hot tub outdoors on lower balcony! Fully stocked condo with every amenity you can imagine. We no longer offer discounted Freedom lift passes. the resort was purchased by a new owner in 2013 and the passes are no longer offered for purchase. This is our second winter trip to Brian Head and our first stay in Lori's condo. It was great! Exactly as pictured (so much better than the last condo we stayed). Great kitchen and I always love when the host provides a crock pot (the cooking utensils could be replaced and I couldn't find a cutting board but it wasn't a big deal). All beds were very comfortable and the condo is very, very clean. We are a family of four so there was more than enough room, your could stay here with a much larger family. My son loved the Xbox that was in the bunk room. Location is great and the views were spectacular. We got a lot of snow during our stay and the snow plow was out there every morning clearing the driveway so we did not have any problems. The jacuzzi was an awesome feature and we used it every afternoon after skiing and snowboarding. When we got there the jacuzzi was a little murky but my husband knows how to use the pool chemicals so he got it to clear up and we all enjoyed it. Having a mud room was fantastic. There are no shoes allowed in the condo so having the mud room to take off your boots and hang your jackets was perfect. We entered through the garage every time so we could take everything off in the mud room (and we used the laundry facilities down there every day). I think some people have trouble getting the heat right but we kept it at 64-65 degrees (it was about 20 degrees during the day during our stay) and both levels stayed comfortable at the same time. Overall it was a great stay and we will definitely be back! 8 of us came down for a 3 day getaway. The condo accommodated all of us with room to spare. There are 2 chair lifts at the bottom of the condo roadway so this was as close to ski in/ski out as you can get. The hot tub was a hit, extra towels for the hot tub and bathrooms. 3 bathrooms with full showers, and the kitchen had more amenities then I've experienced in the past. The garage fits 2 cars tandem. I would highly recommend and would come back. There are 3 flights of stairs so make sure your fitbit is fully charged. Great place and perfect location if your hitting the slopes! Our family loved the location being right next to Brianhead! 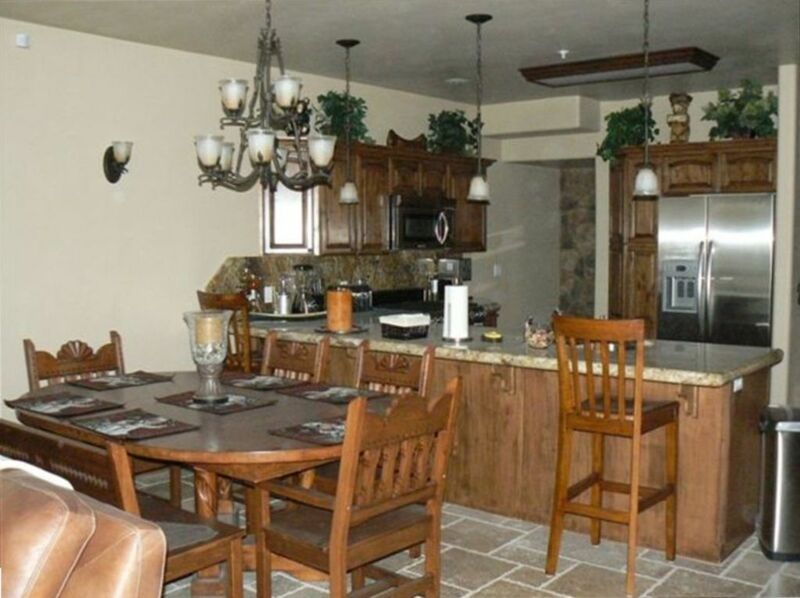 Hit the slopes all day, stop in for lunch at the condo. Great condo and worked perfectly for my wife and I and 4 kids. The hot tub was amazing after a day of snowboarding and what a great movie collection to relax by the fireplace and watch a show as a family. Thanks for a great family trip! Sleds in the garage were a bit hit! Loved our stay here. The condo provided us with everything we needed for a great stay! CLEAN, lots of room. very spacious! Would highly recommend this apartment. Great place. Kitchen nicely stocked, even spices, coffee and tea! Ski: Brian Head is a popular location for winter sports. The resort gets around 400 inches of snowfall annually. Winter activities include: skiing, snow boarding, sledding, snow mobiling, tubing, and, of course, snow angel making. There are numerous locations for equipment rental and they are all very near the condo. You’ll never have to go far to get what ever your heart desires. 2 night min. stay non-holiday. 3 night min. stay on Holidays. $125 cleaning fee.